Anthony (Tony) Glenn is a Research Plant Pathologist with the U.S. Department of Agriculture, Agricultural Research Service (USDA-ARS) in the Toxicology & Mycotoxin Research Unit in Athens, Georgia. Tony is also an Adjunct Assistant Professor in the Department of Plant Pathology at the University of Georgia, where he received his MS and PhD before joining USDA-ARS in 2001. Since that time he has worked with mycotoxigenic Fusarium species, primarily F. verticillioides that produces fumonisin mycotoxins. 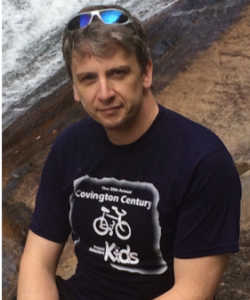 As Lead Scientist, Tony directs a large research project investigating the adaptive fitness of F. verticillioides. Tony’s research focuses on the physiology of these fungi, with a particular interest in the molecular genetics, genomics, and evolution of the biochemical mechanisms controlling how the fungi cope with xenobiotic compounds and environmental stress, especially as it impacts mycotoxin production, virulence and endophytism. Tony joined the Mycological Society of America as an undergraduate and has been a member for 27 years. His service to the society includes: Councilor for Cell Biology/Physiology (2009-11), Mycologia Associate Editor (2011-16), Foray Coordinator for the 2017 annual meeting in Athens and the Program Committee (2015-present; Program Chair for the 2019 meeting). Tony has also served as Associate Editor of Phytopathology (2005-07) and on the Joint Editorial Board for Journal of Applied Microbiology & Letters in Applied Microbiology (2008-13). Outside of the lab, Tony’s other passions are cycling and anything that expands his DIY skills.